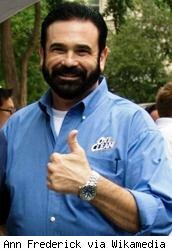 Billy Mays, the television pitch man who was almost single-handedly responsible for the popularization of the mute button, died today at the age of 50. He passed away at his home in Tampa, Florida. The cause remains unknown at this time, although CNN reports that Mays may have been hit on the head by falling baggage when the US Airways flight he was on yesterday blew a tire on landing. An airlines spokesman told CNN that no injuries were reported. The local medical examiner will perform an autopsy on Monday to establish the cause of Mays' death. Billy Mays because famous, or perhaps infamous, for his loud, loud, carny-like ads for OxyClean, a product of Orange Glo International. He later took on other brands for the company including Orange Glow and Kaboom. He was particularly successful at hustling the products on the Home Shopping Network. By the time of his death, Mays had hawked over 30 products, appeared in an ESPN ad, and been the subject of a Discovery Channel documentary, Pitchman. Annoying as his ads were, I'll never again hear a man raise his voice and wax ecstatic, or see a man with a black beard that appears spray-painted on, without thinking of Billy Mays. When Michael Jackson died this week, his album sales went through the roof. Perhaps now we'll witness a run on OxyClean, in Billy's honor.